Providing you the best range of battery operated integrated grease meter with effective & timely delivery. 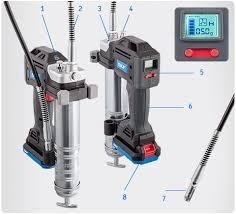 SKF-MAKE Batter Operated Grease Gun with integrated Meter - TLGB20Develop to Maximum efficency,Battery Operated Grease Gun includes an integrated grease meter to help prevent over and under lubrication. The unique tool features a durable,ergonomic design with a three point stand for operator comfort and convenience and a 20 Volt, lithium-ion battery for longer life. Suitable for a variety of manual lubrication tasks,the TLGB20 can be used to lubricate bearing and machines in industrial and manufacturing enviroments, as wellas agricultural and construction vehicles. The Tool's Display indicates battery charge level,amount grease dispensed, pump/motor speed and blocked lubrication points. The versatile grease gun provides two flow rates - LOW and HIGH and deliver pressure up to 700 bar ( 10,000psi) and features a built-in-light to illuminate the work area. Integrated Grease Meter Delivers Precise Lubrication: The TLGB20's Grease Meter allow the Technician to see exactly how much lubricant has been dispensed in order to avoid OVER - AND UNDER Lubrication. Two speed Flow Rate : Enable Adjustment from Low volume to Hight Volume Flow to suit the application. Battery Charge Display: Indicates Lithium battery charge Level. Led Light :illuminates work area to help locate grease Fittings in Dimly lit envoriments. TLGB20 -2 -20V Li-Ion Battery. Looking for Battery Operated Integrated Grease Gun With Meter ?